배경 및 목적 - 뇌졸중 후, 뇌경색 주변부위에서 시냅스외부에 존재하는 A형 GABA 수용체에 의한 신경 흥분 억제를 통해 지속적인 흥분성 저하가 나타난다. 본 연구자들은 A형 GABA 수용체 α5유형의 경쟁적 길항제인 S44819에 의한 수용체 차단이 허혈 후 신경 회복, 뇌조직 재형성 및 신경 가소성을 증가 시킨다는 가설을 세우고 실험을 수행하였다. 방법 - 수컷 C57Bl6 / j 마우스의 국소 뇌경색 (일과성 중대뇌동맥 폐색) 모델에서 뇌졸중 후 72시간부터 S44819 (3 또는 10 mg / kg)를 28일 동안 구강 투여 하였으며, 약물투여 14일 후 신경학적 회복, 뇌경색 주변 조직의 재형성 및 손상 반대측 피라미드로 가소성을 측정하였다. 결과 - 뇌경색 후 10 mg/kg의 S44819 투여그룹에서 운동 조정과 공간 기억을 지속적으로 향상시켰으며, 선조체 위축의 감소 및 신경 세포의 생존율 증가를 나타내었다. 지연성 신경보호 현상으로 경색 주위의 성상교세포증 (astrogliosis) 감소, 모세혈관 밀도 증가, 손상측 뇌실하층 (subventricular zone)에서의 신경전구세포의 증식 및 분화의 증가를 보였다. 손상 반대측 피라미드로 가소성은 전향적 추적검사에서 S44819에 의해 영향을 받지 않았다. 신경영양인자인 BDNF와 GDNF (brain-derived neurotrophic factor 와 glial cell line-derived neurotrophic factor) 및 혈관생성 성장인자인 VEGF 및 BFGF (vascular endothelial growth factor 와 basic fibroblast growth factor)는 S44819 처리에 의하여 뇌경색 주변부위에서 증가되었다. 결론 - 본 연구의 결과를 종합해볼 때, S44819는 급성기 뇌졸중 단계에서 신경학적 회복과 뇌경색 주변부위의 재형성을 향상시키는 것을 알 수 있다. Figure 1. Delayed delivery of S44819 at 10 mg/kg but not 3 mg/kg promotes postischemic recovery of motor coordination deficits. Combined analysis of the exploratory study (animal set 1) and confirmatory study (animal set 4). 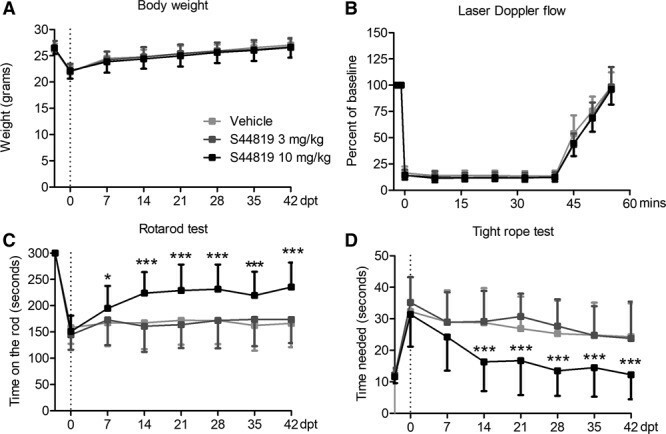 A, Body weight, (B) laser Doppler flow (LDF) recordings above the middle cerebral artery territory core, and (C and D) coordination skills evaluated by Rotarod and tightrope tests in mice exposed to transient middle cerebral artery occlusion (MCAO). Vehicle or S44819 (3 or 10 mg/kg BID) was administered for 28 d starting 72 h after reperfusion. Body weight (A) and LDF recordings (B) do not differ between groups. Results are means±SD values (n=36 animals per group). *P&li;0.05, ***P&li;0.001 compared with vehicle. Figure 6. S44819 elevates neurotrophic and angiogenic growth factors in the peri-infarct brain tissue. 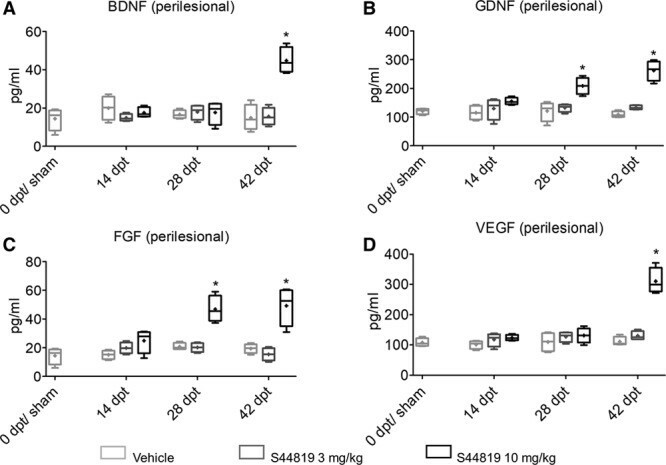 Concentrations of (A) BDNF (brain-derived neurotrophic factor), (B) GDNF (glial cell line-derived neurotrophic factor), (C) FGF (fibroblast growth factor), and (D) VEGF (vascular endothelial growth factor) in peri-infarct striatum and cortex evaluated by ELISA in mice exposed to transient middle cerebral artery occlusion (MCAO) or sham surgery that were treated with vehicle or S44819 (3 or 10 mg/kg BID) starting 72 h after reperfusion. Results are medians (lines inside boxes)/means (crosses inside boxes)±interquartile range (boxes) and minimum/maximum data (elongation lines; n=6 animals per group). *P&li;0.05 compared with ischemic vehicle. Stroke. 2018 Oct; 49(10): 2495–2503.